When ghosts and skeletons appear in popular media directed toward children and teens, they are usually utilized to frighten; the same is true of hospital rooms and medical equipment. 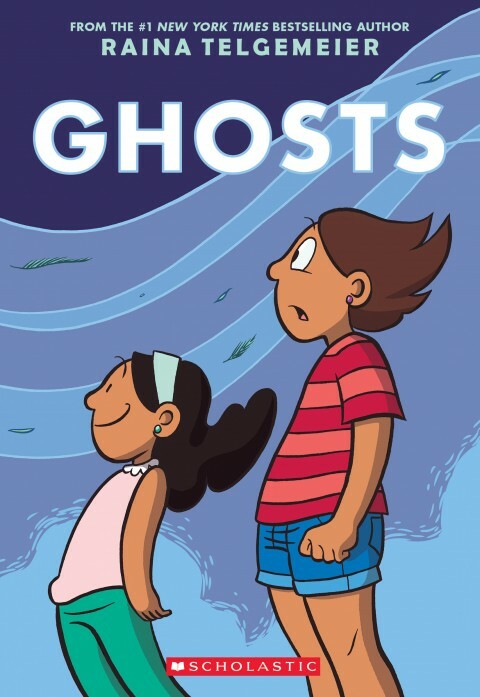 But not in Raina Telgemeier’s graphic novel Ghosts. This delightful book explores these two realms of spirits and chronic illness with wit, curiosity, and insight, facilitating a level of ease with both of these normally scary topics. Catrina and her younger sister Maya have just moved with their parents to northern California. Maya has cystic fibrosis, and her doctors have suggested that the cool, moist sea breezes may help with her symptoms. Catrina is not happy to move. She does not want to leave her friends and the life she has built. And their new environs are very strange to her: the air is always dense with fog, and the gusts from the ocean are quite cold. But the worst thing about this new place is that it is filled with ghosts — and with people who don’t seem to be afraid of them. Catrina’s journey into this wild new landscape coincides with a setback in Maya’s medical condition. She confronts her fears of the spirits and of her sister’s possible death, supported by new friends – some in human form, others in ghostly form. Telgemeier’s drawings of ghosts and skeletons are full of life; vibrantly colorful and richly detailed, these spectral visions welcome Catrina into a world where death is not terrifying. The novel highlights the Days of the Dead festival, a Mexican holiday created to honor ancestors who have died. In our oftentimes death-avoidant culture, it is refreshing to explore other approaches to the end of life. The sisters’ new hometown is a place where life and death are interwoven; and this setting enables the sisters – and the readers – to contemplate new ways of relating to death and dying.